Seeing how the season restarts this weekend (WOOHOO!) 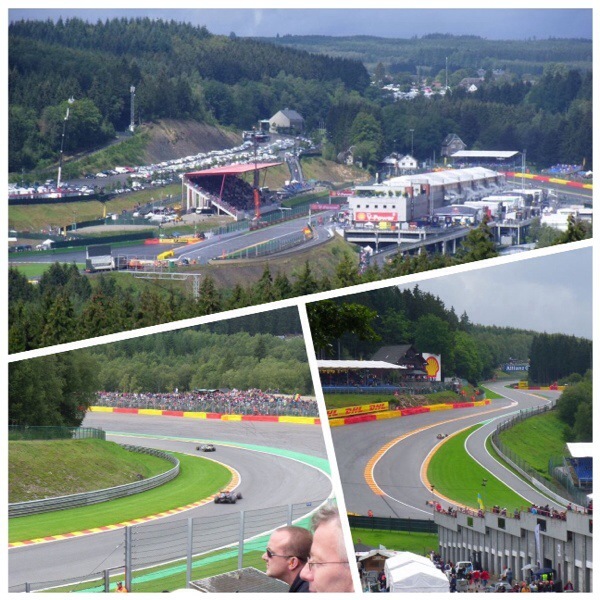 and that it’s the Belgian Grand Prix it seems only fitting I should write about our little trip to Belgium in 2011. This was my first ever F1 holiday! Both myself and a colleague at work saw that a local bus company were doing a trip to see the F1 in Spa. Her other half really wanted to go so we both attended an open day event in December 2010 and picked up a 10% discount each to go with them in August the following year. As we were also the first to book we got to nab the front row seats of the bus! August 2011 came quite quickly and we travelled from North Wales all the way to Spa-Francorhamps in Belgium. The bus left North Wales at 3am but we were so excited that we couldn’t sleep overnight on the bus! Instead we managed to sleep on the ferry ride over to France. We arrived at the hotel in Hasselt on the Friday evening so unfortunately we didn’t get to see the practice sessions. On Saturday morning we had arranged with the bus driver to meet him at 8am so we could get to the circuit as soon as possible. There were about 20 of us on the trip and we were all gathered in the hotel’s lobby dressed in our racing regalia and by 8.30am there was still no sign of the driver! In the end we had reception phone his room and he was down in 10mins – he had forgotten to change the time on his watch!! Anyway we got going and it didn’t help that the driver didn’t know the way! Thankfully the signposts were quite clear and we had someone who had been before to guide him. After a trip through the woods of the Ardennes Forrest we arrived at the circuit. As we had general admission tickets we walked up past the Eau Rouge hill and settled on the embankment at the Kemmel Straight to watch the action. It meant sitting on grass and it wasn’t the most comfortable place to be! 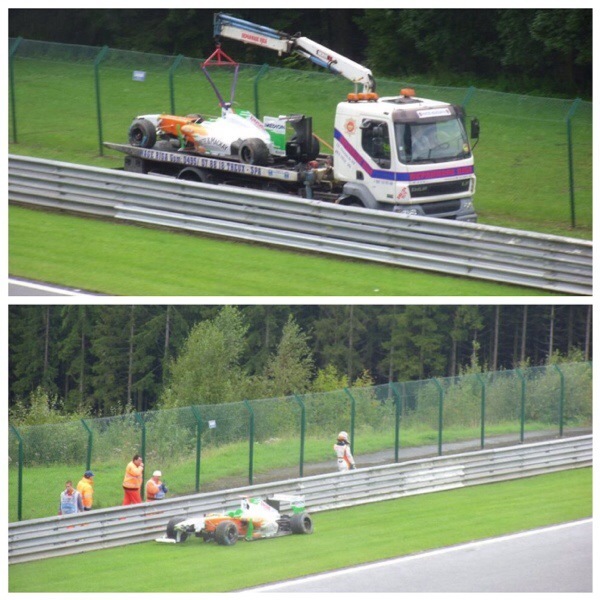 We got to see a lot of fast cars and we even got to see Adrian Sutil crash his Force India into the wall. Sore arses for all 4 of us!! We returned to the hotel that evening and had food which was part of the package. It wasn’t very nice – seafood soup which neither me or the hubby like! The food wasn’t bad – their steaks looked lovely but due to the menu the coach company had opted in we weren’t too impressed!In fact two of out party were so unimpressed with the food that they went out fr pizza and brought it back to eat at the bar!!! Bloody good idea that was – wish we’d done the same! We joined the rest of the party in the upstairs bar for a drink or two before going to bed. In Sunday we travelled to the circuit again. 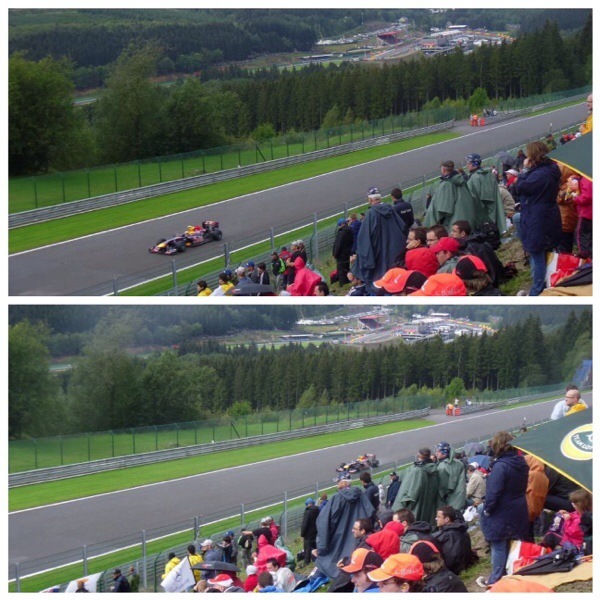 This time we came in by a different road and so we walked towards Pouhon corner and settled there to watch the race. On the way we bought two foam seats to protect our bums!! It wasn’t ideal due to the incline of the embankment the foam padding worked more like a sled!! We hoped to see a few cars spin off at the Pouhon corner but unfortunately the weather stayed dry throughout the race so no spins! However Hamilton ceased out spectacularly at the end of the Kemmel Straight. In hindsight we sat in the wrong places on the wrong days really. If we had been in Kemmel Straight on race day we would’ve seen some overtakes. But never mind! The best move of the day however was Webber’s pass on Alonso at Eau Rouge. It was spectacular! Due to the length of the Spa circuit there wasn’t a victory lap which was a shame! And we decided not to go onto the track which we now regret. But no matter we’ll be back there one day and we thoroughly enjoyed this trip! Have you ever been to the Belgian GP? My sister’s on about going to Spa now. 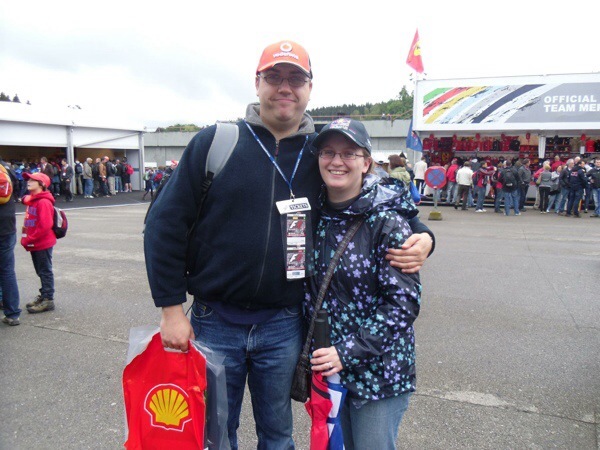 We took her to Hockenheim a few years ago (it’s literally down the road from where I live!) 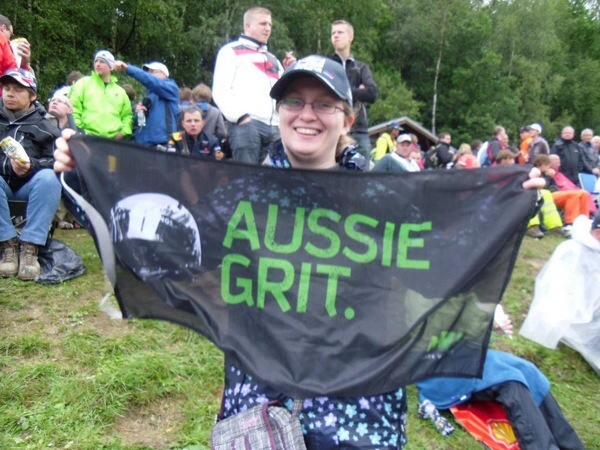 and this year she went to Silverstone. Has she ever been to Spa? It was great (if you don’t mind a spot (!) of rain)! Ooo well I now know where I can stay when Hockenheim happens!! 😉 did she have fun in Silverstone?